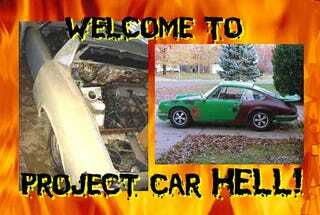 PCH, No Escape From Engine-Swapped Porsches Edition: VR6 914 or Corvair 912? Perhaps you breathed a sigh of relief after Chevy-Powered Porsche Hell was over with, figuring that (with the small-block-motivated 911 winning so decisively) you would be spared the temptation of a hacked-up Porsche sporting a non-Stuttgart engine for quite a while. However Project Car Hell doesn't work that way; just because you were able to walk past the fiery gates once doesn't mean you won't be lured right back in by the same kind of bait! That's why we're returning to Porsche Engine Swap Hell today, this time going for six cylinders instead of eight. PCH, Chevy-Powered Porsche Edition: 911 or 924? 914 owners often talk about the 914-6 when that starts-with-a-V car manufacturer is brought up. Yes, if it has a Porsche emblem on the hood and a six-cylinder engine in back, it's got to be a real Porsche, right? Not so fast, though- what if you were to put a Volkswagen six-cylinder in your 914? What would you have then? We're not sure, but you'll be sure to come up with an answer to that question soon after buying this 1974 Porsche 914 with Volkswagen VR6 engine (go here if the ad disappears). Yes, someone has gone ahead and swapped the VR6 engine out of a '93 Corrado into a Porsche 914, then slapped on a fiberglass body kit for good measure. Don't worry about the quality of the swap, because the seller assures us that a "30 year professional" (professional beekeeper? bathysphere repairman? ocarina player?) did the work; however, you should be aware that this project "needs alot, but its a great start." There's no cooling system, but you'll sort that out right after you figure out where to put the fuel tank. Hey, how about adding the supercharger off a G60 Corrado while you're at it? When you hear the name "Porsche," what comes to mind? Aside from Ferdinand's ripoff of Tatra's patents, that is? That's right, you think of the 911 (and its identical-looking sibling, the 912)! So why beat yourself senseless trying to get a crazy engine-swapped 914 working when you could just as easily push a crazy engine-swapped 912 project up that infinitely high mountain? And we're going to make it even easier on you by giving you a shot at a 912 with an engine using the same boxer-six configuration as the Porsche powerplant that fit just fine in the 911. That's right, we've got a 1966 Porsche 912 with a turbocharged Chevy Corvair engine (go here if the ad disappears) for you, and the price is only four grand! You'll have to spend some time fixing the rust "underneath," then get to work on making the engine run again. And no worries about getting a Powerglide, because this car comes with what must be the Porsche 5-speed and perhaps an adapter plate from JC Whitney.